In this compact and pithy book, the distinguished and prolific psychoanalyst Salman Akhtar steps out of his consulting room to address certain matters of urgent global concern. These include migration across national borders, the current refugee crisis, ethno-racial prejudice, subjective distress of minorities, and, above all, the forever-present ominous shadow of terrorism. Akhtar evolves and advocates a uniquely 'anthropological psychoanalysis' which is a blend of depth psychology and humanities, including sociology, economics, political science, history, and , of course, anthropology. He deconstructs what seems self-evident and confronts his readers with some socio-politically unpleasant realities, both within psychoanalysis and in the prevalent perspectives on the on-going turmoil and bloodshed in today's world. His book is not all doom and gloom, however. It also delineates ameliorative strategies for dealing with the pain of the disenfranchised and the misguided violence of the radicalized. This is applied psychoanalysis at its best. Salman Akhtar’s book is an impressive and passionate plea for a culturally relevant psychoanalysis. His deep knowledge of the field enables him to describe the issues with a bilateral flow of information between psychoanalysis and the humanities. He brilliantly explores current questions of migration, minorities, social prejudices, and terrorism. He also offers strategies for diminution of the pain of minorities and of prejudices as well as guidelines for the remediation of processes of dehumanization associated with terrorism. This book is an urgently needed psychoanalytic contribution to our present social and political problems. This is an extremely captivating, timely and courageous book. It reveals Salman Akhtar's highly original hermeneutics and pragmatic vision of the current global crisis. Akhtar addresses the contemporary chaos and dislocation of the spirit of our times from the lens of his ‘anthropological psychoanalysis’. He speaks the unspeakable and unmasks the politically uncomfortable, while remaining faithful to his personal sense of poetics, psychoanalysis, and fairness in human affairs. 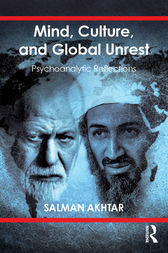 In this book, the prolific psychoanalyst, Salman Akhtar, leaves the comfort of clinical practice and turns his gaze to current global turmoil. By forging dialectal links between unconscious intrapsychic dynamics and sociocultural phenomena such as prejudice, the problems of minorities, and the complex origins of terrorism, he lays down the groundwork for a truly modern anthropological psychoanalysis. Akhtar’s book needs to be known not only to all psychoanalysts but outside the psychoanalytic circles as well. Akhtar makes a brilliant case for an anthropologically-informed psychoanalysis and a culturally relativistic approach to patients and to political praxis. He recognizes that we, and those we treat and oppose, do not exist in a cultural vacuum; rather we and they think and work in our respective cultures with manifold unconscious assumptions. His work is deeply informed on the national, regional, and cultural permutations of Muslims and Islam and he offers trenchant recommendations for constructively dealing with the terrorism of radical and radicalized youth. Salman Akhtar, MD, is Professor of Psychiatry at Jefferson Medical College and a Training and Supervising Analyst at the Psychoanalytic Center of Philadelphia. He has served on the editorial boards of the International Journal of Psychoanalysis, the Journal of the American Psychoanalytic Association, and the Psychoanalytic Quarterly. His more than 300 publications include 86 books, of which the following 18 are solo-authored: Broken Structures (1992), Quest for Answers (1995), Inner Torment (1999), Immigration and Identity (1999), New Clinical Realms (2003), Objects of Our Desire (2005), Regarding Others (2007), Turning Points in Dynamic Psychotherapy (2009), The Damaged Core (2009), Comprehensive Dictionary of Psychoanalysis (2009), Immigration and Acculturation (2011), Matters of Life and Death (2011), The Book of Emotions (2012), Psychoanalytic Listening (2013), Good Stuff (2013), Sources of Suffering (2014), No Holds Barred (2016), and A Web of Sorrow (2017). Dr. Akhtar has delivered many prestigious invited lectures including a Plenary Address at the 2nd International Congress of the International Society for the Study of Personality Disorders in Oslo, Norway (1991), an Invited Plenary Paper at the 2nd International Margaret S. Mahler Symposium in Cologne, Germany (1993), an Invited Plenary Paper at the Rencontre Franco-Americaine de Psychanalyse meeting in Paris, France (1994), a Keynote Address at the 43rd IPA Congress in Rio de Janiero, Brazil (2005), the Plenary Address at the 150th Freud Birthday Celebration sponsored by the Dutch Psychoanalytic Society and the Embassy of Austria in Leiden, Holland (2006), the Inaugural Address at the first IPA-Asia Congress in Beijing, China (2010), and the Plenary Address at the National Meetings of the American Psychoanalytic Association (2017). Dr. Akhtar is the recipient of numerous awards including the American Psychoanalytic Association’s Edith Sabshin Award (2000), Columbia University’s Robert Liebert Award for Distinguished Contributions to Applied Psychoanalysis (2004), the American Psychiatric Association’s Kun Po Soo Award (2004) and Irma Bland Award for being the Outstanding Teacher of Psychiatric Residents in the country (2005). He received the highly prestigious Sigourney Award (2012) for distinguished contributions to psychoanalysis. In 2103, he gave the Commencement Address at graduation ceremonies of the Smith College School of Social Work in Northampton, MA. Dr. Akhtar’s books have been translated in many languages, including German, Italian, Korean, Portuguese, Romanian, Serbian, Spanish, and Turkish. A true Renaissance man, Dr Akhtar has served as the Film Review Editor for the International Journal of Psychoanalysis, and is currently serving as the Book Review Editor for the International Journal of Applied Psychoanalytic Studies. He has published 9 collections of poetry and serves as a Scholar-in-Residence at the Inter-Act Theatre Company in Philadelphia.